The best of Southern Africa in accommodations by Relais & Châteaux, the world’s finest hoteliers. Experience upgraded accommodations, special added excursions, selected private tours, elephant back and walking safaris, game drives, and a mixture of trendy luxury and relaxed elegance on our Safari In Style with Relais & Châteaux. Commence this amazing adventure in gorgeous Cape Town. Explore her peninsula, at the Cape of Good Hope. Discover the breathtaking beauty of the Cape Winelands; tour a vineyard and stroll the quaint streets of Stellenbosch. Kruger National Park – South Africa’s finest wildlife refuge, the Park is home to all the Big Five. Venture forth on morning and afternoon guided game drives, in open safari vehicles. Then wing your way to Johannesburg, the vibrant and pulsing capital city. Only a brief stop here, as you are bound for Victoria Falls … what the locals call the “Smoke that Thunders”. Delight in a guided tour of the Falls and ply the famed Zambezi River on a sunset boat cruise. The allure is Africa is undeniable. And what better way to fall under her spell than to start this amazing adventure in gorgeous Cape Town? Explore her peninsula with its quaint fishing villages, colonies of barking seals and a most improbable collection of arctic penguins. At the Cape of Good Hope – witness the angry Atlantic and sanguine Indian Oceans meet and mingle. Discover the breathtaking beauty of the Cape Winelands; tour a vineyard, sip some of the famous local wines, and stroll the quaint streets of Stellenbosch. 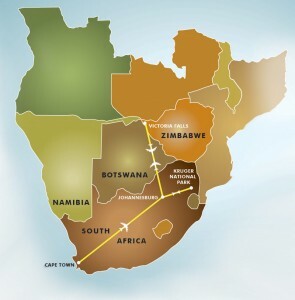 A reluctant ‘farewell’ to Kruger as you wing to Johannesburg, the vibrant and pulsing capital city. Only a brief stop here, as you are bound for Victoria Falls … what the locals call the “Smoke that Thunders”. Delight in a guided tour of the Falls and ply the famed Zambezi River on a sunset boat cruise. As a special treat: a 30 minutes opportunity to meet and interact with Jabulani’s elephants. Always accompanied by their handlers, the elephants are relaxed and there is the opportunity to observe their herd dynamics, as the younger elephants play under the watchful eye of the adults. There’s plenty of opportunity for photographs during the half-hour interaction time, and handlers will provide information on individual elephants and fascinating herd behavior. Established over half a century ago, Relais & Châteaux is an association of the world’s finest hoteliers, chefs and restaurateurs that has set the standard for excellence in hospitality. Relais & Châteaux has redefined luxury hospitality by emphasizing holistic experiences that transport its guests, taking them on a sensual journey and introducing them to a deeper, truer understanding of the Art of Living. Spy penguins, seals, ostriches and cavorting baboons on a full day drive to the tip of the Cape of Good Hope. Standing at the edge of the continent, perhaps you can see where the Indian and Atlantic oceans meet. Take in the defining highlights of the city and popular waterfront and then enjoy another full day of glorious scenery traveling through the Winelands: tour a vineyard, samples the wines and admire the old Cape Dutch architecture at Stellenbosch. Stay at Relais & Châteaux’s Jabulani in Kruger National Park – This camp is a perfect translation of the African bush, seamlessly blending classic and elegant interiors (fit for princes and kings, but warm enough to make the most “down-to-earth” feel completely at home) with the natural bush beyond. Fly to the big city… busy reinventing itself as a trendy metropolis. A private car promptly delivers you to the hotel for a long and luxurious night’s rest. While at the natural wonder of the world, Victoria Falls, “mosi oa tunya”, or the “smoke that thunders”, you can enjoy the many activities that your accommodation has to offer. While some cost additional, the activities include a multi-hued sunset cruise on the mighty Zambezi River, an impressive Victoria Falls guided walking tour, superb fly fishing on unstressed waters, canoe tours, and more. Wing back to Johannesburg and your departure flight. With wonderful memories and a few thousand photos! I awoke to my first morning in South Africa. Sweeping aside the curtains, I gazed down on the beautiful city of Cape Town, bathed in the bright morning sunshine. Beyond, the ocean sparkled like sapphires. Glancing up, I saw Table Mountain, looming huge against the brilliant blue sky. I must have taken a dozen photos. I had heard it was a special treat to see the mountain clearly without the ‘white tablecloth’ of clouds shrouding her flat peaks. I was blessed, indeed, to have such a spectacular ‘welcome’ to South Africa!